The U District Station (light rail) will open at Brooklyn Ave NE and NE 43rd St in 2021. The station, as well as parts of Brooklyn Ave NE and NE 43rd St, are planned and designed as shown here. This community-driven Mobility Plan will address transportation improvements outside of the station. Its goal is to coordinate a variety of improvements so that people can safely and comfortably get to the station by walking, biking, transit, and driving. Support the continued vitality of the U District. High volumes of pedestrians will enter and exit the future U District Station (light rail) and walk on NE 43rd St and The Ave (University Way NE). Most buses along 15th Ave NE have "fixed" routes, meaning that their routing is unlikely to significantly change (though all bus routes are still in various planning stages at Metro and SDOT), and their riders either do not need to transfer to light rail or would transfer more efficiently at the UW Station (Husky Stadium), Northgate, or Roosevelt. Buses running along NE 45th St are relatively "fixed" routes that would benefit from a direct transfer at the U District Station. 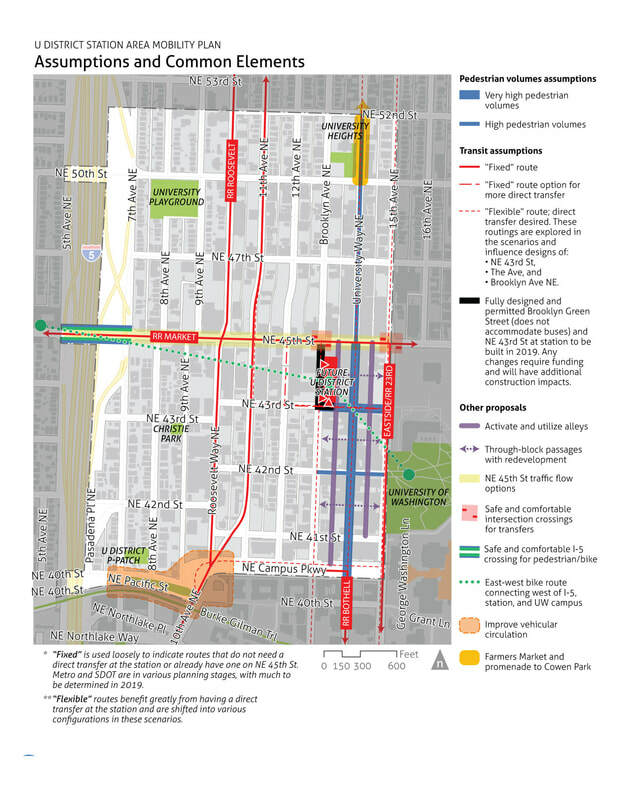 The Ave, some 15th Ave NE, and potentially the 31/32/75 routes are "flexible" (routing is not determined) and would benefit from direct transfers at the U District Station. Brooklyn Ave NE and NE 43rd St designs adjacent to the future U District Station are complete, fully permitted, and expected to be built in 2019. The present design does not allow buses on this section of Brooklyn Ave NE. Volumes of buses shown in the scenarios are the maximum potential number; there could be fewer. ​Other proposals shown on the Assumptions and Common Elements map below are not as affected by transit network routing and are addressed outside of the scenarios. 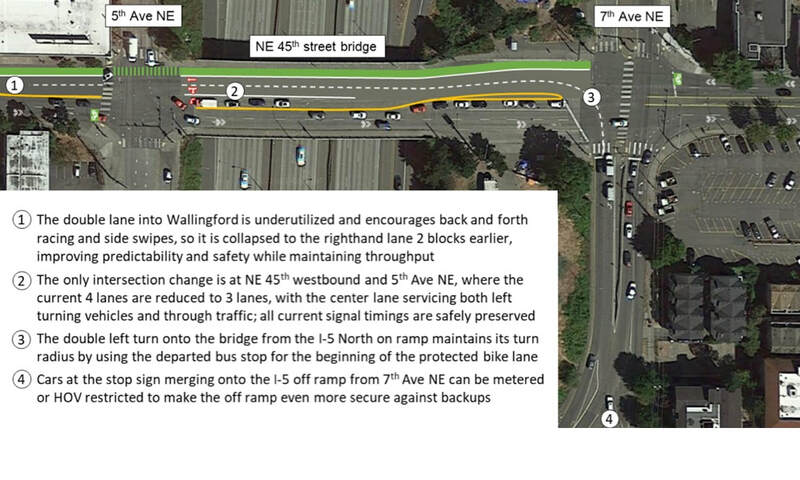 Share your thoughts on the alternatives for the re-design of NE 43rd Street by taking the online survey. The results of the survey help guide the development of the first street within the area to be re-built by the Seattle Department of Transportation.